Markets for Smartphone’s biometric sensors are divided into fingerprint recognition sensors and face recognition sensors. While Apple is planning to apply its 3D face recognition technology, which was introduced for the first time last year through iPhone X, to more of its Smartphones, Android Smartphones are planning to counter that with upgraded fingerprint recognition technology. Application of biometric recognition is being expanded towards mobile payments and bank services on top of being used to distinguish a particular user. It is likely that related industries will be either happy or sad depending on which technology grabs upper hands in the future. According to industries on the 15th, it is heard that Apple is planning to apply face recognition (3D sensing) modules to more of its products in 2018 and 2019. This kind of signal was recently detected through LG Innotec’s movements. LG Innotec, which is manufacturing face recognition modules for iPhone X, announced that it will be investing $821 million (873.7 billion KRW) into its facilities. “This investment is for camera modules of mobile devices and businesses for new modules.” explained LG Innotec. LG Innotec did not specify if this investment was for Apple. However industries suspect that this new investment was made for Apple’s face recognition modules. Apple incorporated face recognition module into iPhone X for the first time in 2017. It took out fingerprint recognition function that was used to recognize users and introduced face recognition technology that analyzes characteristics by scanning one’s face in 3D. Although it was expected that Apple will apply face recognition technology only up to the model that will succeed iPhone X and will be released this year, it seems that Apple is planning to apply this technology to its other Smartphones that will be released in 2019 as well. Fact that LG Innotec’s investment is scheduled under 2019 supports this prediction. While Apple is pushing for face recognition technology, Android Smartphones are expected to have better version of fingerprint readers especially under-display fingerprint readers. Fingerprint recognition has become one of the major functions of Smartphones that cannot be left out when Apple acquired AuthenTec in 2013 and Samsung and LG started to apply it to their Smartphones. According to a market research company called Strategy Analytics, rate of adoption of fingerprint recognition quickly increased from 10% in 2014 to 23% in 2015 and to 44% in 2016 when it was merely 3% in 2013. It estimated that this rate was 55% in 2017. Smartphone’s fingerprint recognition function is expected to be improved, and one of the examples is ‘under-display fingerprint reader’ that is hidden under a display and does not require a physical button. Chinese Smartphone manufacturer called VIVO introduced a Smartphone with an under-display fingerprint reader that uses sensors from Synaptics at CES 2018. Because this kind of reader analyzes shapes of fingerprints just by having one put his or her finger on top of a display, it does not require a physical button. It allows Smartphone manufacturers to design front of their Smartphones more smoothly and it increases amount of space that can be filled on a display. This is the reason why it is seen as a necessary technology for implementing full-screen Smartphones. However it seems that these readers still need to be improved even more. VIVO has not decided on when it is going to release its Smartphones that it introduced at CES 2018. These Smartphones are more of like prototypes. VIVO once introduced same type of Smartphones that use sensors from Qualcomm instead of Synaptics in 2017. 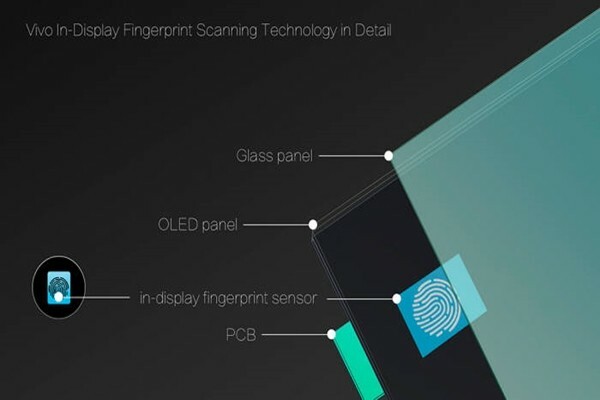 It is seen that this year will be an important starting point for under-display fingerprint readers while performance, production yield, and mass-production are seen as obstacles from under-display fingerprint readers being used more widely. “We predict that under-display fingerprint readers will prepare breakthroughs in 2018 as Samsung, LG, OPPO, VIVO, and Huawei are planning to apply them to their phones.” said a market research company called TrendForce.